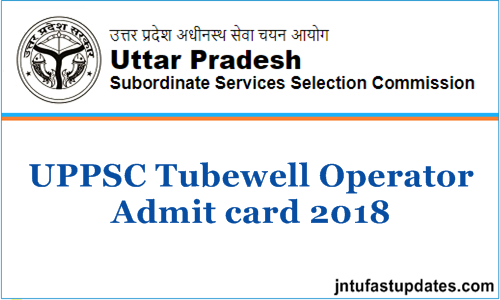 UPSSSC Tubewell Operator Admit card/ Hall Ticket 2018: Uttar Pradesh Subordinate Services Selection Commission (UPSSSCC) Will conduct the Tubewell operator examination on 2nd September But exam cancelled and new date will be announce soon. The UPPSC has earlier announced 3210 Tubewell Operator posts in 2018. Due to a large number of posts announced, many of the suitable candidates have applied for the Tubewell operator (Nalkoop Chalak Posts). The organization is going to conduct the Tubewell operator examination in a large number of places across the Uttar Pradesh state. Aspirants applied from various parts of the state can check UPPSC Tubewell operator examination venue details from the hall ticket. The UPPSC will give the information of the examination venue, date and time of examination on the hall ticket. Hall ticket/admit card is the most required document to proceed with the examination. The examination officers will allow the candidates to the exam only after verifying the hall ticket of the contender. If the contender fails to show their hall ticket at the time of verification the candidate will not be allowed to attend the test. Hence the candidates are instructed to carry the admit cards without fail. The Uttar Pradesh Public Service Commission is the state level government organization looks various functions of the state. This organization offers various jobs for the suitable aspirants. Annually it releases various job notifications to hire the aspirants. The organization has recently announced a notification for 3210 Tubewell operator (Nalkoop Chalak) posts. The organization received a large number of applications from the interested and eligible aspirants. Screening of the aspirants will be done through the written test and interview rounds. Candidates have to clear the written test round to be forwarded for the interview round. The organization is going to conduct the UPPSC Tubewell operator examination on September 2nd. Candidates who are going to appear for the examination will have to download UPPSC Tubewell operator admit card to attend this examination. The admit card will be accessible to download on UPPSC official website, uppsc.gov.in. The UPPSC is going to conduct the Tubewell operator examination on 2nd September. Applicants who are going to attend the test can download tubewell operator hall ticket before 10 days of the examination. The hall ticket/admit card is tentatively Released in last week of August (tentatively). The official website of UPPSC, uppsc.up.nic.in will activate the link to download the admit cards soon before the examination date. Hence applicants can download the admit card by clicking on the corresponding link. Candidates have to carry the admit card and hall ticket as a must while going to the examination. Hall ticket verification will be done as a must in the examination hall. Also, candidates have to show the Aadhar card at the verification time (this is must to follow rule implemented by UPPSC). Candidates can check the details of examination center, date and time of the examination from the hall ticket. The organization is going to specify the information of the candidate such as the name of the candidate, date of birth, signature, photograph, register/hall ticket number, and other required details on hall tickets. Candidates can download the hall tickets from UPPSC website, uppsc.up.nic.in and check the hall ticket clearly once. If any of the corrections appear, candidates can contact the authorities through the helpline numbers, 7084396139,7084391055,7084393183,7084394679 (10 am to 6 pm Monday to Saturday). admit card/ call letter for UPSSSC tubewell will be available in last week of august. Exam Cancelled on 2nd Sep and New date is 12.01.2019. Visit the UPPSC Official website, Upsssc.gov.in or from the direct link given below. Search for UP Tubewell operator admit card 2018 on the homepage. Sir mera upsssc tubel operater ka registration no kho gaya hai kya admit card net se nikl sakta hai? Sir mera regd no kho gaya hai upsssc tubel operater ka kya admit card net se nikl sakta hai? Please inform me syllabus of tubell operater clearly.